I’m starting a long weekend–a much needed break. I’ve been editing various manuscripts full-tilt for a few weeks now, and I sat down at my computer yesterday and realized that I was dry. I could see that the chapter needed work, and I could even see what needed to be done, but I couldn’t bring myself to do it–a good sign that it’s time for a break. So long weekend, here I come! So take a look where you buy your Harlequins, and see if you can spot mine! I can’t wait to see it in person! 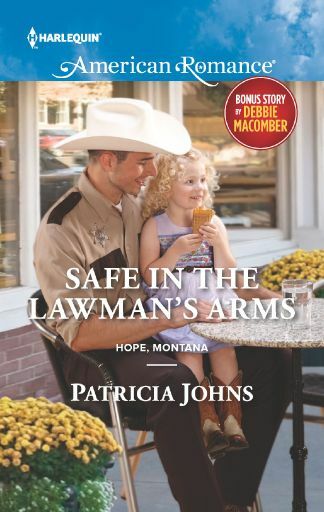 I have a new cover to debut: Safe in the Lawman’s Arms! This book will hit the shelves February 2016, and I couldn’t be more excited to share this new series with you set in the small ranching community of Hope, Montana. Montana sheriff Mike Cruise never pictured himself as a father. But with temporary custody of a toddler, he has to learn the ropes fast. Thankfully, his sweet new nanny, Malory Smythe, fits right in, and Mike begins to believe he can make this family thing work. Although it can’t last forever. After her cheating ex left her pregnant and alone, Malory could easily fall for a strong, protective man. But she can’t risk repeating past mistakes with men, especially with a child on the way. When their makeshift family is threatened, will it drive Mike and Malory apart… or will it bring them together for good? Enjoy a special bonus short story by #1 New York Times bestselling author Debbie Macomber, MY FUNNY VALENTINE.